My good friend and colleague, Philippa Brakes, an expert on cetacean behavior and ethics, recently alerted me to a BBC essay by Victoria Gill called "Chimpanzee language: Communication gestures translated." I was extremely interested in this mass media discussion of research on "The Meanings of Chimpanzee Gestures" recently reported in the journal Current Biology (only the abstract is available for free), but was rather concerned about some of the claims of one of the researchers about the very limited presence of intentional communication among nonhuman animals (animals). The upshot of this extremely interesting and important project was that wild chimpanzees were observed to use 66 gestures to communicate 19 specific messages (there are lovely illustrations in the BBS essay). I also had a few other emails from people who were equally concerned, hence this brief response to the BBC essay. While the data seem sound (but, see Note 1 below), in the BBC essay one of the researchers, Dr. Catherine Hobaiter, is quoted as saying, "this was the only form of intentional communication to be recorded in the animal kingdom. 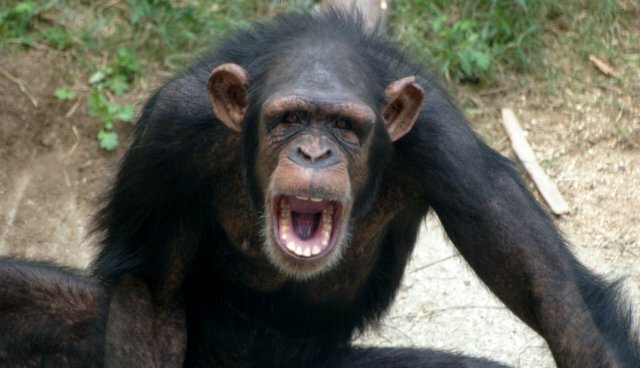 Only humans and chimps ... had a system of communication where they deliberately sent a message to another individual." However, a simple Google scholar search for "intentional communication in animals" yielded many other examples of intentional communication in which a message is sent directly to another individual. Indeed, we've recently learned that fish also use intentional referential communication to signal the location of food. Dr. Hobaiter also claimed, "The big message [from this study] is that there is another species out there that is meaningful in its communication, so that's not unique to humans." Dare I say, based on a huge amount of detailed data, that individuals of many other species are meaningful in their communication. Along these lines, University of Manchester evolutionary biologist and primate expert, Susanne Shultz, notes, "the meanings seem to not go beyond what other less sophisticated animals convey with non-verbal communication." We must be very careful about making sweeping generalizations about the cognitive and emotional capacities of other animals. I wrote this corrective essay to bring to light that these sorts of generalizations can be very misleading, especially to an unknowing public who are keenly interested in the cognitive and emotional lives of animals and depend on researchers and media to put out the correct story. Once again, I want to stress that while I see this study of chimpanzee gestures to be very interesting, the data do not at all warrant the claim that chimpanzees are the sole animal members of the "intentional and meaningful communication arena." Clearly, they are not. Note 1: "Dr Susanne Shultz, an evolutionary biologist from the University of Manchester, said the study was commendable in seeking to fill the gaps in our knowledge of the evolution of human language. But, she added, the results were 'a little disappointing'. The vagueness of the gesture meanings suggest either that the chimps have little to communicate, or we are still missing a lot of the information contained in their gestures and actions."